Is it possible to make the intangible, tangible? That’s the challenge when it comes to Hawaii. The destination is one that you have to experience to understand and it goes beyond the beach to the experiences that it makes possible. What are those experiences and what makes them unique? It starts when you step off the plane, into the open air Honolulu Airport, and stays with you during your entire stay. The first thing one notices comes via the soothing trade winds that carry the sweet scent of the islands. You are immediately in an Aloha state of mind. This state of mind continues on as you reach your hotel and step into the lobby. Step into the Westin Moana Surfrider and you are stepping into history and another unique feeling that reminds you of a different era. You are on vacation and, despite your type-A tendencies, you have downshifted your mind and your body and are one with the breeze. It’s as if a switch has been thrown and there is nothing you can do but go with that feeling; it will stay with you the remainder of the trip. Hawaii isn’t the cheapest vacation you will take, but it will be one of the most memorable. It starts with that initial feeling, a feeling that seemingly permeates your soul, and becomes enhanced and more acute as you take it all in. It also gives you a good workout in nature’s fitness center. You’ll work up a good sweat while you garner the feeling of accomplishment as you look back at the distance you’ve traveled. As you stand upon the crater the wind will caress and cool you. 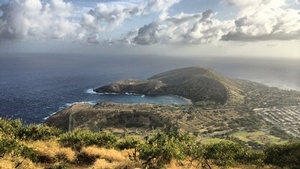 As you gaze down you’ll see the marine sanctuary at Hanauma Bay in the distance and, if you are up for it, end up there a short time later for a swim. Turn around and beaches dotting the shoreline along the windward coast appear deserted from your viewpoint, and when you arrive, may be just that. You may have them to yourself, or share them with others, but you will marvel at the power of what nature, and God, has created. This is just day one, you are thinking, as you settle into and enjoy what will become a vacation of a lifetime. As the days move forward, you’ll try your hand at paddle board, doing a seven-mile downwind paddle along the Kahala coast. 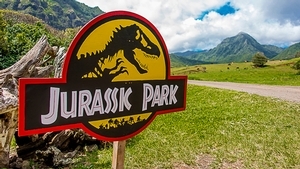 You’ll head over to the windward coast and experience a full day at the 4,000 acre outdoor playground known as Kualoa Ranch, where you’ll ride an ATV, take a horseback ride, and see where Jurassic Park was filmed. Each evening you’ll settle into a spot on the porch or at the beach bar of the Moana Surfrider, listening to the soothing rhythm of live music that keeps the Aloha Spirit pulsing through your body. Hawaii is far more than beaches and beautiful scenery. It brings you into a state of mind that has to be experienced to understand. It is a destination that creates a series of Travel Forward moments for you and your family; moments that will be remembered for a lifetime.